OUFI: Abortion - whose prerogative?. 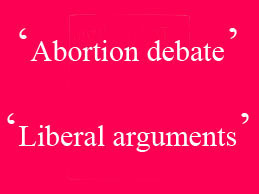 Abortion must be one of the thorniest subjects one chooses to argue for or against. Twenty years ago abortion was illegal in most countries and nearly always hazardous: today it is legal in most developed countries and a routine medical procedure. Concern for the unborn and the Rights of the mother to terminate the pregnancy on the basis whether she has the right over her body is what concerns this article. I shall endeavour to discuss from a moral and legal standpoint and ethical Rights of Mother to be and the Rights of the Foetus, if any, and of communities’ existing moral obligation to it. I also stress, however, this piece will not involve arguments for or against contraception or the broader picture for the containment of world population. Also, it will not touch on the religious aspect of right and wrong conceptualised within any religious beliefs; as it so often happens, such argument could take distinct political colouring. We (as a society) need to see through the jungle of Rights to seek the Truth. Truth can be subjective and relativistic making it very hard to find in such a contentious subject. So the next best thing is to apply for justice, for both mother and infant, that are universal within all moralistic structures on offer. Hence, this contribution is rare, to my knowledge, in qualifying its efforts from moralistic perspectives. Even here Justice can be elusive so perhaps we would need to settle for legal definitions what society constitute an acceptable stand to provide the guidelines that can eventually rhyme with the universal acceptance if that can ever be possible for this highly emotive subject. 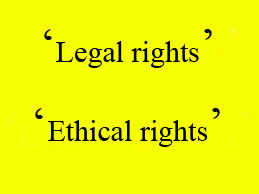 Rights: I would have thought there was a theoretical difference between moral rights and legal rights. 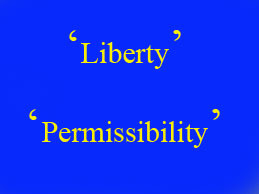 A moral right is an entitlement that someone 'ought' to have, whereas a legal right is an entitlement enshrined in law. The two may coincide but then again they may not either because a moral right exists but has are not enshrined in law, or because a legal right exists which is not held to be moral. Quite often, however, the legal rights outline the course of our moral rights. It is important to grasp these points especially for those who might harbour the terms of Killing, Murder and Infanticide in the context of reading this article as justification to deter abortion. In contrast, this argument argues for the moral permissibility of abortion and whether a ‘wrong’ can be committed against a foetus or mother to be or a mother. So here is an opportunity to step back and look at the issues, to disengage from the emotional and religious prejudices to allow for rational analysis. The whole of my argument will circumscribe into its orbit three major themes that must go to establish it: the division of cells developing into a foetus, and the significant transformation of the foetus into a person. The three themes we will briefly examine along the way; the inception of human Life, Consciousness and how both can give ground to personhood. We also need to bear in mind that everything that is conscious must be alive; it will be impossible to try to explain consciousness without explaining life. If an entity that does not satisfy any one of these criteria is certainly not a person. These elements, therefore, by all accounts, must be central to the concept of personhood and by definition that only People have full moral rights. I will carry this argument a little further. Genetic humanity is neither necessary nor sufficient for establishing that an entity is a person since community accepts that a – e are the primary criteria of personhood. “A man or woman whose consciousness has been permanently obliterated but who remains alive is a human being which is no longer a person. Defective human beings, with no appreciable mental capacity, are not and presumably never will be people; and a foetus is a human being which not yet a person and therefore cannot coherently be said to have full moral rights.” M.A. Warren. The next question we need to ask is how far since conception does a human being need to be before it begins to have a moral right – not necessarily of being a full person but of being like a person? This position brings us to the argument that had recently raged, between those for pro-life and those for pro-choice, in Texas, USA for extending the termination limits from 20 weeks (early term) to 40 weeks (third trimester). 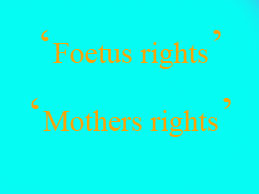 Some argue, however, that even if an eight-month foetus has features that arouses in us our protective instincts but still can not reason or communicates or associates to it one of the criteria mentioned it would still have no moral rights to life. It would still feel pain at a rate of a tiny fish and on that scale can never override a woman’s right to obtain an abortion. If we were to turn this argument on its head and say that new-born are no different to a nine-month foetus at being people using the above five criteria we end up with the possibility of saying it is morally right to kill newborn. Thus, it might seem that if a late-term abortion is sometimes justified, then infanticide must also be sometimes justified. Why should having be born to make a difference? According to the above, both abortion and infanticide are morally permissible. Not quite! Because neonates are so very close to being persons, it is tough to justify its killing morally. Other reasons why our society hold that infanticide is usually wrong is that in cases where the parents of a new-born who do not want their infant for some reason there are people who may wish to adopt it. Even if that infant is considered unadoptable because of some defect society would still dictate it would be wrong to kill it. As long as society feels this way it has the moral prerogative to insist that it is wrong to destroy any infant which has a chance of living a reasonably satisfying life. If we now accept that infanticide is wrong within the moral precepts within this society (moral community), then we must also accept that late term-term abortion is also wrong. There are, however, two crucial differences between the two cases. On the one instance once the infant is born its continued life does not pose a threat to the life of the mother. In contrast, the pregnant woman, to protect her life, averting a threat to her life caused by her pregnancy, must outweigh other people’s desire for her to keep the foetus especially when removing the risk without terminating the pregnancy. In such cases the mother’s fate overrides the baby’s moral right to life whereas the moment of birth does mark the end of the mother’s right to end its destiny. Where there are no such threats to the life of the mother, we must, therefore, accept the moral disequilibrium and for a third-trimester abortion to be wrong because as we have shown such an abortion is akin to infanticide. 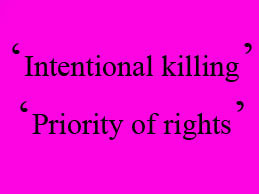 Having crossed over into the moral community, abortion, therefore, at this late stage, will be morally impermissible.